A Slightly Artistic Woman: Peace and Love guys, Peace and Love. A couple of things have happened to me just recently which makes me wonder if quilt-land is dividing rapidly. Or perhaps it's just me dividing? Always a possibility I suppose. One of these things is nice, and one not so nice. Let's start with the nice one. It's about that quilt again. You may recall that it was in a London exhibition recently, and as a result of that I had a request to bring it along to Cambridge University and talk for a bit. The person who wrote had a very long title but was basically Chair of Humanities at one of the Colleges and a Senior Member of the Classics and English faculties, and they wrote an influential arts publication. They were interested in quilts and could I felt, help bring quilting to the attention of other influential people who may be unfamiliar with them as an art form. Of course, I was highly delighted. For me, even if it comes to nothing, its a huge step forward in getting quilting (and I genuinely mean quilting, and not me) better recognized in the art world. It's really important to me that quilts are viewed as another art form and not Women's Work and a craft. This doesn't mean I deny that history, just that it should be valued beyond that. Historically painting and sculpture have been done largely by men, and because of that have become fine art, despite being crafts too, but stitch is seen as female and is undervalued. Now the yucky bit. About two days later, I went to visit a friend at her quilting group of 10 ladies. All enthusiastic, all keen to chat about the latest techniques and show their work. Wonderful. But as part of their discussions they began to talk about art quilts. They called them (and I'm quoting here) "arty-farty nonsense" The conversation began to get quite heated and I'm not at all sure why. There was talk about "fighting back" and reclaiming quilting for "ordinary quilters". I honestly couldn't believe what I was hearing, and I'm still totally baffled. Were they threatened? Were they just showing solidarity with each other? What reason was there for such prejudice and unkindly words; let's be honest, nonsense? A fight might have been in the offing, but of course, I didn't say a word in deference to my friend but I was itching to! So I've blogged instead! Come on ladies, there's room for everyone. I wouldn't dream of decrying another artist, quilter, painter, writer, sculptor, or anyone for that matter who is having fun, making, or doing whatever floats their boat. Could I perhaps suggest that we're responsible for holding ourselves back too? There's enough silliness in the world. Tut. Congratulations on your honor, well deserved. As for the naysayers, "Tut" indeed! I hadn't thought of it as an honor exactly but I know what you mean, and thank you. I'd thought of it as just another step to be taken! But it is true that shows are becoming more art based and sacrificing the traditional. Not all of us are able to paint like you and there is a pressure to make something artistic if you want to win a prize. Dear Annonymous, But I've NEVER won a prize in any quilt show! Thank you for your comment though. It's sad if you think there is a move away from what you love, and you feel pressured to make "art" The art/not art argument seems endless and has been being going on for years, but art is only your voice...the way you blend colour or put fabrics together, the patterns you choose or the pictures you want to make. There are many traditional quilts in art galleries and are treasured for their work, social commentary, and dozens of other reasons. And as for painting. I'm very much a novice with much to learn. It's not something that comes easily. Each quilt is a battle but I just keep going and trying. It's what we all do with the things we love and I'm sure that applies to you too. As far as I know quilt shows will always show quilts of quality no matter what methods are employed. Prizes are down to the judges, and as a good friend of mine said recently..."it's all a bit of a lottery"!! There is no need to win a prize, I think. You must have fun in the work you do whatever the name is, traditional or not. I love, love yours Annabel. Whished I could do that. Thank you Ineke, that's very kind. Prizes are difficult. They give recognition to yourself and to others of worth, and provide money which is a nice bonus to some but income and publicity to others trying to make a living, I can understand the previous comment, and the desire to make something that is tailored to win a prize but I'm still not sure you can second guess the judges. I think it's just a good idea to do what you want and forget the rest. It's funny, but here in Canada, we have the opposite experience. The BIG shows want traditional work for the most part; it's been only in the last couple of years that they've accepted art quilts, and they're STILL judging them based on traditional quilting techniques, which many of us don't use. We're still battling for acceptance (well some people are). I enter my work in art shows in the US ir Canada, or textile art only shows in Canada, or quilt shows in the US so I don't have to bother with their narrow mindedness. I am not a quilter and am amazed at the work that goes into 'art' quilts and traditional quilts, there is room for both and I for one would be sad to see either denigrated by the other. I am a tapestry weaver and that has had several changes in direction since the 60's but all are equally valued by other tapestry weavers I think, hope. There is room for all and I think especially in the textile sphere we all need to stick together and see our work more valued by the world as a discipline in its own right. I am loving the crows in your previous post. So true Debbie, there's space for everyone. There is a lot of work in many quilts. Some quilts are valued more because of the amount of work involved, and that's fine; some paintings and sculptures have a lot of work too. I can gawp equally with a baltimore applique quilt and the drawings of the autistic artist Stephen Wiltshire. Having said that, I feel we don't need to only value something because of the work involved though, very simple things can have more beauty after all. The thought processes behind something have more value to me, but that's a personal viewpoint! First of all, congratulations on the honour, it is of course well deserved. Secondly, your experience with the guild is why I don't use the word " quilt" in the description of what I do. They aren't really, anyway. Although I *do* quilt my work, you certainly couldn't sleep under them, they don't have bindings or mitered corners as they're either mounted, faced or have unfinished edges, and if the quilting world doesn't want to claim me, why bother with them? I don't have time to change people's minds, and as someone who is Buddhist adjacent, I don't want to. They're entitled to their opinion. And I can go elsewhere and find acceptance and pleasure. That said, I agree that it's a shame we can't all work together and laud each other as branches of the same tree. Bless you Kit, thank you. I went through a phase after doing City and Guilds of not calling myself a quilter. I was a textile artist, a designer maker, anything really. I couldn't call myself an "artist" as to me that was a term of huge magnitude, and I didn't think it applied to me, but grew into it as I gained confidence . It's only recently that I've reverted to calling myself an art quilter as I feel I want to make that distinction when talking to galleries etc. It's a USP. Funny old world. I think I would have had to ask what "ordinary quilters" were! We have a phrase in Scotland - "it's aye been", ie innovation is terrifying and we'd rather stick to what we know, thank you very much. What a lot they're missing, though! Not heard that one before Christine. Ah, we shall miss you Scots folk if you give up on us in September! 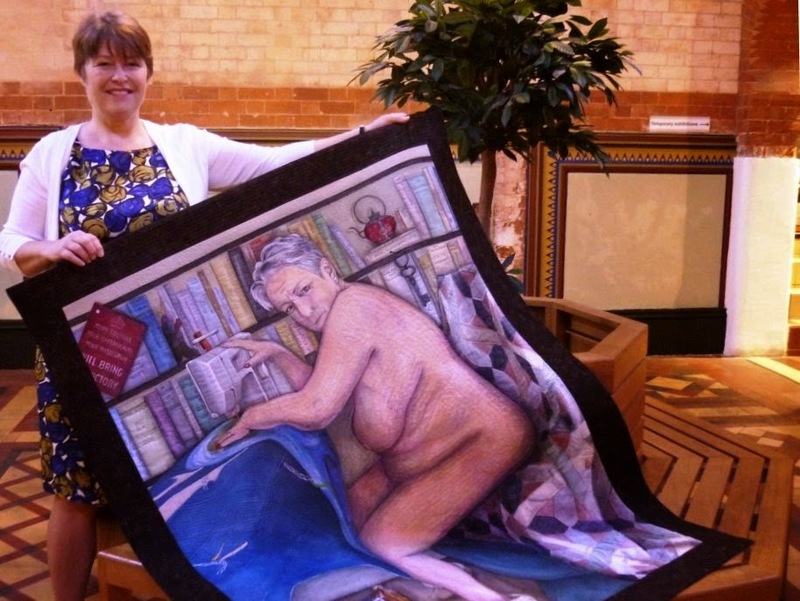 Congratulations on your honour and for raising the profile of quilts in the art world yet again. I think that the group you went to must have contained some very narrow-minded people as the traditionalists that I know recognise the value of all types of quilting, even if they don't want to veer away from traditional themselves. I do disagree with the anonymous comment about having to produce art quilts to win prizes. Firstly, that is surely not the reason for making quilts - we should be doing it because we enjoy it, and, secondly, if prizes are important then there are many shows where art quilting frequently takes second place to more traditional entries. Not to mention the categories at FOQ of course! I say, long live variety. Oh yes Maggi. As narrow and as convoluted as a spiral staircase. I agree actually that there's probably more venues for traditional quilters than art ones...though I suspect I might get one or two commentaries to the contrary. I'm thinking about my own work here, when I was told recently that the Life quilts weren't really suitable for Grosvenor...which is quite a few shows really. Still we're better apart....I'm getting quite fussy myself these days!! If I had to guess, I'd say those people definitely feel threatened, and it is comforting to get together with others that feel the same and bolster yourselves with such negative comments. Would they have gone on like that had they known the type of quilting you do? Would they be embarrassed after the fact if they learned? Or would they feel a certain kind of triumph in having aired their views - so there! Someone got in a snit and when in a snit, one doesn't always care to delve deeper and gain some understanding of the issue. If they are calling art quilting as a whole nonsense (although I agree, there are plenty of art quilts that ARE nonsense), then they really don't understand the movement as a whole & decided they don't want to understand it. I'm guessing it's not unlike the initial reaction to the impressionist painters. Heck, initial reaction? There are still people who think some of that movement not to mention other modern ones are nonsense. I have to admit to a period in my own quilting career when I lost my patience with the rhetoric of the new wave of quilters talking about how traditional quilting bored them and they just had to explore these more art-based ways of quilting. I was anything but bored with all the ways blocks could be colored and arranged. I didn't mind that these women were doing something else, just minded the way they talked about it which sounded so condescending to those of us sticking with traditional work. So imagine my chagrin when I too reached a point where I found myself a bit bored with the traditional work and infusing more "artsy fartsy" stuff into my original designs - oh, I get it now! I so admire the technical skill that goes into the traditional quilts, in some ways those quilters need to be so much more skilled than those of us who mostly dabble in art quilts. It pains me that they feel marginalized and threatened but I sure understand why they do. I always make a point of praising them when I can. You have been a great ambassador for quilts and I can't think of an instance when you've ever said anything about how you've chosen to express yourself that sounds like those early art quilters who one could almost hear sadly sighing that the rest of us just didn't get it and move on to a type of quilting that was so much more interesting. I'm so in awe of your work, it's complexity, it's attention to detail, it's depth of meaning and its incorporation of traditional elements. Just keep on being yourself and winning people over one small step at a time. As for the rest, well, it's their loss that they are being narrow minded. Goodness IB, thank you for that wonderful comment. You can't always second guess peoples motives as they can be so complex. Group (and I wanted to say pack, but didn't) behaviours are fascinating. Whatever we do in this field, if we keep on doing it, evolves over time. We get better, more experienced, push boundaries, incorporate new ideas. It would be sad if we didn't. We can look back and reflect, but we nearly always move forwards. I believe that in any situation there are many right answers. Since I have realised this, I have found my life and thought processes to be infinitely richer since I have actively sought out different people's take on a "right answer". Textile art is a brilliant example of this. I started with quilting when I was highly stressed at work, and handling fabric, with repetitive movement calmed me. At the time, my taste was for the traditional. As I have looked more widely, I have liked more adventurous work with a concept, message or narrative that challenges. There are many skills held by other people that I would like to be more commonly valued. In my opinion, it is very easy to value skills that you hold when you see them in others, less so when you have no understanding of what it takes. Because I believe women's skills to be generally undervalued, I am keen to promote them, and to promote them in innovative ways. To be a questioning viewer of artwork requires a change in thinking, and goes beyond a technical appreciation. It goes beyond self, and towards others. I look at a lot of stuff that is not my taste, but from this I have gained an appreciation of the link between the concept and the object. It goes beyond the traditional skill and the object. I do not have to like the object to gain from looking at it. Keep going Annabel. I gain hugely from looking at your work, and even better,I love it. Thank you Cathy for your kind words and considered comment. I also try and view the wide horizons looking at those things I don't especially like or find attractive. It's this thing I call emotional response that I'm looking for - something that moves me in some way - and that could be anything from originality, skill, subject matter, message, colour, interpretation etc. Its an indefinable something!! Dearest Annabel - been away, so apologies for the late comment, but Yay! and Grrr!! I may well trip over my words here as I am rushing because I should be making tea for DH and DS who is home for a brief visit, so even more apologies in advance. Well done for taking up the chance to talk to the Uni students - you can only inspire and inform so go for it! As for the quilt group - I think they are only exemplifying some universal truths. People fear that which they do not understand. Fear is weaker than love but shouts louder. People moan in groups more than they exalt, just in case someone else disagrees - why it is riskier to say you like something than that you don't like it, I would love to know, when we have all been told to say nothing rather than something horrid!! If shows are giving more space to 'art' quilts and less to 'traditional' quilts, perhaps it is because few quilters who devote their skills to tradition are doing anything that hasn't been done a gazillion times before, (ducks to avoid brickbats). As for whether people call themselves artists, quilters, gardeners, mothers, knitters, bad drivers, Elvis fans, Sealed knot Civil War recreators, or mushy piles of emotion, can't we be all we say we are or all that we practise, without the weight of history and the suffocation of judgementalism choking us into silence. DS has just asked what we are having - to whit the reply was "I haven't decided yet" so I had better cease the pontifications, ("What do you do?" "I am a pontificater".) and prepare a Sunday tea!! .. a large hand painted quilt on a charity find pieced top. It won best non traditional quilt at NZ's 2013 National Quilt Symposium. My kudos came tho when it took out viewers choice. Despite that, I still had murmurings ( never to my face) that it really wasn't a quilt, not real quilting which disappointed me as I am fairly new to this quilting world. However I am comforted by the fact that some people talk to me about my quilt and say how they saw a story of their lives in that quilt. NZ Symposium 2015 committee must be applauded - they have set themes fro sections so no segregation of quilting types so traditional, modern and art can sit together on however they interpret the theme - very refreshing and I will delight in all types for their skill and approach to the theme without bias - diversity keep the "ART and CRAFT of quilting" alive! Keep leading the way!